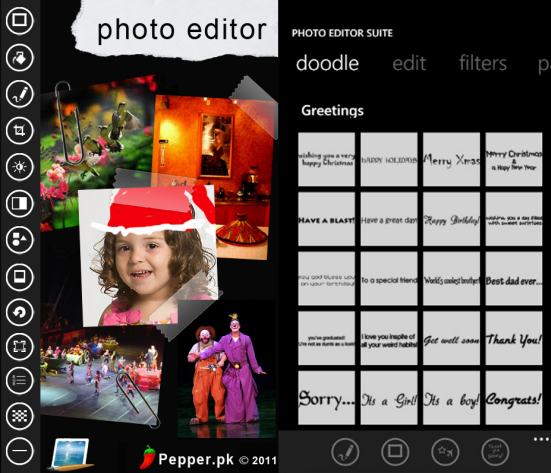 Photo Editor Suite application for Windows Phone 7 has been released. Your WP7 takes great pictures and you use it all the time to record the happy moments in your life. What if you want to edit your photo, adjust the brightness level, crop it a little, rotate or recolor the picture to make it perfect and then share it with your loved ones? With this app you can do all these things. Download Photo Editor to make life easy and edit any picture you take, using your WP7, straight off your handset. Save the modified file and then share it with friends and family as much as you want! Change color to black and white, Pop, Negative and Sepia. Fully Recolor the photo in RGB mode. Download the app for $1.99 from windows phone marketplace.